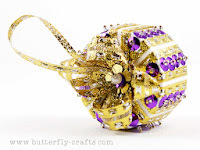 If you're like me and you love a Christmas tree that really sparkles when the lights are all turned on and it's dark outside then consider treating yourself to beautiful handmade Christmas decorations from Butterfly Crafts. 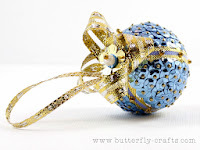 These handmade Christmas Decorations not only look fantastic on the tree but would work really well tied into a handmade garland. But they are also perfect to buy for friends as an extra special stocking gift and work really well if you make your own crackers for the table at Christmas lunch and want to include something beyond the mini pack of cards or plastic ring! 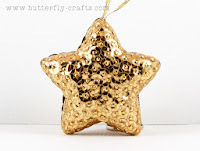 I have a range of decorations available including Boots, Baubles, Stars, Bells, Presents and the extremely popular Christmas Pudding - I could not get enough of these made last year and so have started early this year! I also have a range of colours available including the traditional reds, greens, golds, silvers and whites to the more contemporary blue, black, purple, pink and brown depending on the colour scheme you have on your tree. As I know that Christmas can be an expensive time of year, why not spread the cost a little of having beautiful handmade decorations with my pre-payment plan. You can order whichever shapes you would like and in the colours of your choice, pay a non-refundable deposit of £2 per item and then pay the balance (with postage) when they have been made for you. 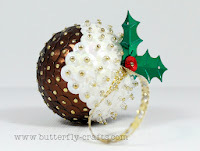 Find out more about my Christmas Decoration pre-payment plan here.